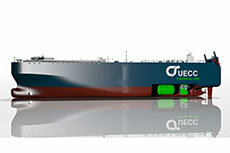 United European Car Carriers (UECC) has announced that it recently launched the TBN Auto Energy – its second LNG dual-fuel pure car and truck carrier (PCTC). The vessel was launched at the NACKS shipyard in Nantong, China. UECC is jointly owned by Wallenius Lines and Nippon Yusen Kabushiki Kaisha (NYK). 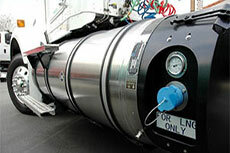 TBN Auto Energy has capacity of 3800 cars, including 6000 m2 of high and heavy cargo. It will be the world’s largest dual-fuel LNG PCTC, and will be capable of loading cargo on 10 decks. The TBN Auto Energy must now undergo sea trials and gas trials. It is scheduled for delivery to UECC in Nantong on 28 November 2016. UECC has signed a contact with MAN Diesel & Turbo for the first LNG-powered Pure Car/Truck Carriers. United European Car Carriers has signed a contract to construct two dual-fuel LNG car and truck carriers.